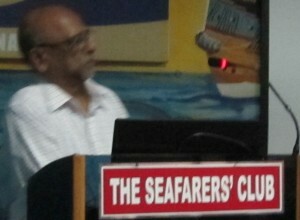 Second Quarterly Round Table (QRT) Discussions on “Blue Economy – Prospects and Challenges for India” was hosted by National Maritime Foundation (NMF), Chennai Chapter at Seafarers Club, Chennai on 06 June 2015. Consul – General of Japan, Mr Seiji Baba and former National Security Advisor Mr MK Narayanan were the prominent guests present in the QRT. Cmde (Retd) RP Prem Kumar, Senior Defence Analyst: Strategy and Security Related to Blue Economy. Dr (Capt) Suresh Bharadwaj, Resident Director – Maritime Training and Research Foundation: Blue Economy – HR Dimensions & the Skilling Conundrum. 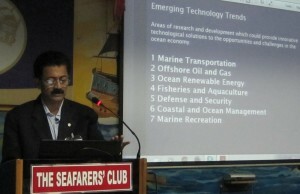 Dr R Venkatesan, Group Head, Ocean Systems, National Institute of Ocean Technology: Technology Aspects. Dr K Venkataraman, Director, Zoological Survey of India: Marine Biodiversity. Dr Vinod Surana, Managing Partner, Surana & Surana, International Attorneys: Legal Dimension. Cmde (Retd) RS Vasan, Director, Centre for China Studies: The China Factor. Blue Economy has to be Safe, Secure and Sustainable. India has to be prepared to face Network Centric Warfare (NCW) threats. National Cyber Security Policy needs to be refined and fully operational at the earliest. Network Centric Security needs to be strengthened. 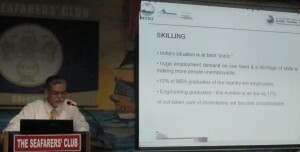 Only 10% MBA graduates, 17% Engineering graduates are employable. By the year 2026, 64.8% of India’s population would be in the working age of 15 – 64 years. There is an exponential growth of educational institutes whereas there is a steep decline in the quality of education. Taking up jobs that are not related to skill levels and under paid jobs lead to frustration in the society. 17 Central government agencies offer skill development; lack of inclusiveness and poor coordination within the complex federal government structure seem to be the root cause. The Academia, the Industry and the Government have to work together. Need for creating a pattern of professional education integrating a university first degree, professional training, work experience, and options of higher degrees. A pattern of professional career progression integrating employment with higher education into a life-long progressive path. A professional career is based on two basic features – 1st competence based and special training, 2nd life-long work and progressive advancement. ‘Knowledge sharing’ based on Research be achieved in collaboration of Higher Education with Industry. Intellectual links between University and Industry is also needed for capacity building of Research. To ensure institution capacity of meeting the ‘changing demands’, need to evolve from ‘one size fits all’ approach to a more flexible and a interactive style of delivery. ‘Clusters’ comprising political, industrial, academic spheres are needed for value creation and innovation. 1st wave focused in Agricultural Development. 2nd wave focused in Industrial Development. 3rd wave focused in Science & Technology Development. Presently 4th wave is focusing on Robotics – micro and nano robotics; ‘Bio Mimetics’ is developing fast. Commenced Oceanographic Research almost six decades back with enhanced budget allotment for R&D. Has large pool of scientific and technical expertise. Low Temperature Thermal Desalination (LTTD) Plants at Lakshadweep islands. Earth System – is not fully understood by us. We still face technological, operational, site specific, societal challenges. Observations of Marine Biodiversity, Marine Surveys commenced in India and Indian Ocean from the year 1784. Coastal, Marine resources are being exploited without giving importance for sustainability, thus depriving future generations to have access to these resources. Forests – 50% wiped out in the last 100 years. Wetlands – 30% drained out and 70% polluted. Agroecosystems – mass homogenisation has taken place. Mangroves: 40% Mangroves wiped out. Beaches/Coral Reef: Major portion of Corals bleached or silted leading to Soil Erosion of Coastline. Marine Biodiversity has to be protected from destruction as it provides most of the advanced medicine for the present and future diseases. It is the version 2.0 of the Green Economy. It is nature centric, works on the philosophy of ‘replace something with nothing’ concept. It encourages to ‘produce locally and consume locally’. Basic Education to Advanced Education must encourage students to observe and learn from the nature and apply in their respective field of studies, work/employment. Law is a codification of social norms; it is also an instrument to instigate and inspire changes. National Policy on Blue Economy must be clear. Network all Blue Economy associated Industries, Institutions, Academia, Government agencies for resource, knowledge, expertise sharing. Create awareness of Blue Economy in youngsters. Forum needed to support ‘open source innovations’. Reforms are needed in judicial process, police administration to deliver ‘quick justice and economic justice’. Give incentives for energy efficiency, waste management, compliance of law and at the same time give dis-incentives for wastage, pollution, violation of law. Foresee impacts/consequences of policies without considering only commercial aspects. 159,500 sq kms of offshore waters and 64,000 sq kms of land in six cities and two coastal counties. 30% of Marine Research Institutes of Peoples Republic of China in this region. Marine Science & Technology Park (MSTP) is in an area of 576 sq kms. Blue Silicon Valley with more than 35% of city’s population and over 200 marine scientists are working. Over 2096 sq kms of land and 5000 sq kms of sea. Deep sea and off shore exploration, Tax free Ports, China German environmental initiative. 2015 GDP of this area expected to be 78.7 billion USD and by 2020 1 trillion. The traditional mindset that land overweighs seas must be abandoned. will develop modern maritime military force structure commensurate with its national security and development interests. safeguard its national sovereignty and maritime rights and interests. protect Sea Lanes of Communication (SLOC) and overseas interests. participate in international maritime cooperation. so as to provide strategic support for building itself into a Maritime Power. Blue Water Navy, Open Seas Power Projection and Global Reach. US dominance and also to challenge developing strategic alliances. Strengthening of Chinese nuclear forces for ‘medium and long range precession strikes’. Building a combined, multi functional and efficient marine combat force structure. Enhance its capabilities for strategic deterrence and counter attack, maritime manoeuvres, joint operations at sea, comprehensive defence and comprehensive support. China Pakistan Economic Corridor (CPEC). Like ‘Blue Growth – European Union’, India must work for Win – Win situation in the Indian Ocean Region. Hydrographic Survey of areas under Mauritius and Seychelles. Transfer of one Dornier Aircraft. Setting up of Coastal Security Radar Project/involvement in Maritime Domain Awareness (MDA). Change of scene in Sri Lanka with the change of regime. The Lateral Defence Cooperation with Sri Lanka and Maldives. Indian Ocean Dialogue through Indian Ocean Naval Symposium (IONS). IORA members should address security issues themselves rather than relying on international forces. To be strengthened with more members as IONS has 35 members whereas IORA has only 20 members. Conduct MILAN regularly at Port Blair. Increased engagement and presence in the immediate and extended neighborhood. Pro active measures needed in Blue Economy initiatives. Revamping of decision making process at New Delhi. Be an active ERP in SCS – through Vietnam, OVN and cooperative measures. Enhance cooperation with ASEAN, Japan, Australia. Multilateral/Bilateral cooperation, Defence agreements, Training between member countries. Resolve fisheries dispute with Sri Lanka and invest in more projects. Look and Act – East, South and West. To a question whether Sea Piracy and local mafias in the coast line hinder the Blue Economy, the panelists replied that incidents of Sea Piracy have reduced drastically due to action taken by the Navies of many countries. Handling local mafias is purely a law and order problem and can be easily dealt with by Marine Police, Coast Guard. Consul – General of Japan, Mr Seiji Baba and former National Security Advisor Mr MK Narayanan also gave their closing remarks of QRT. 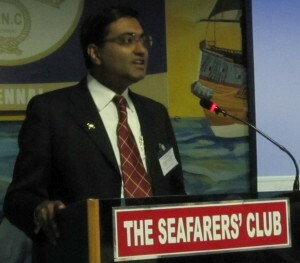 Thanks to Commodore Shekhar, Regional Director, NMF, Chennai Chapter for organising this thought provoking QRT.